Bear happily gathers mouthwatering foods from a park’s visitors until he realizes the moon wants his feast. To sooth his growling belly, Bear dances around a forested park in search of a meal. He’s thrilled by the berries, honey, and fish that he forages, but Bear is most elated by the marshmallows and sausage he frees from ice chests belonging to the humans. Round and full, Moon brightens the night sky during Bear’s spree—clearly Moon has an eye on Bear’s goodies. Protective of his feast, Bear runs and hides from Moon. When he finally escapes Moon’s bright light, Bear has a change of heart and shares his picnic with those around him, a multiethnic and multispecies gathering. Farrell evokes the emotional valleys of a chase scene when Bear’s hungry excitement evolves into anxiety as he tries to avoid Moon’s gaze. Farrell’s conservative use of color in his pencil-and-digital artwork allows Bear’s brown fur and comical actions to pop in each scene. Each page deserves careful study so as not to miss the wacky reactions from animals and humans alike; as the only text is Bear’s increasingly paranoid exclamations, there is much to interpret. 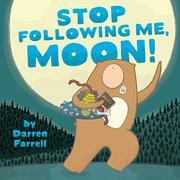 Young readers who grasp the concept that the moon does not actually follow them will be entertained by Bear’s antics. Not only will Bear make readers laugh out loud, but he illustrates how sharing can build a community.